Roof falls continue to be the greatest single safety hazard faced by underground coal miners. During 1996-99, 44 coal miners lost their lives in rock falls, and nearly 2,400 were injured. In addition, nearly 6,000 noninjury roof collapses were reported. Roof supports are installed to protect the miners, but support system failures contributed to most of these incidents. Reducing the terrible toll taken by ground falls continues to be a major goal of research by the National Institute for Occupational Safety and Health (NIOSH). The purpose of these proceedings is to provide the mining community with a comprehensive survey of coal mine roof supports. Drawing on many years of research undertaken by the NIOSH Pittsburgh and Spokane Research Laboratories, this volume describes what types of support are available, how they work, and when they should be used. The major subjects covered include roof bolts, standing roof supports, cable supports, and longwall shields. Some special topics are also addressed, including an analysis of roof fall accident statistics, techniques for better skin control, materials handling considerations, and longwall mining through recovery rooms. 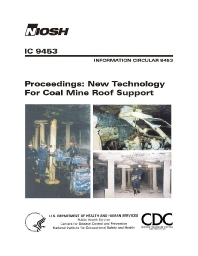 This proceedings volume also contains information on several important new technologies, which are described here for the first time: - Guidelines for selecting roof bolt length, pattern, and capacity that were derived from statistical analysis of the roof fall experience at 37 underground mines; - A new design method for longwall tailgate supports; and - A technique for measuring loads developed within cable bolts.